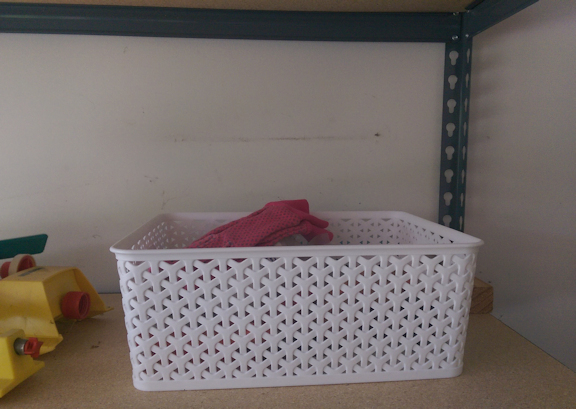 Last week I wrote a Good Things post about replacing old garage shelves. They looked much better, and we had more space for everything that we moved there. The only problem was that one of the items moved was a decrepit, grimy plastic basket where I kept small gardening things such as a spade and gloves. I hadn’t yet gotten around to buying new gardening gloves for this season, either. So this week I made a point of getting out to the store to buy new gloves in a cheerful pink color for spring, along with a somewhat bigger plastic basket, which fits nicely on the shelf in place of the old basket and keeps everything a lot tidier. Much improved—now everything in that area of the garage is looking fresh and new! We also brought a medium-sized plastic garbage can, which hadn’t been used in years and was still in good condition, up from the basement to replace an icky old one in the garage. Always best to be thorough when doing a makeover, whatever its subject may happen to be!